Donnelle Eller reported on the front page of the Business Section in Sunday’s Des Moines Register that, “If the snow piled on your patio has you dreaming of firing up the summer grill, make sure to imagine doling out even more cash for the juicy steaks and hamburgers you’re flipping. “Beef prices climbed 19 percent in January over a year earlier, the federal government reported. And prices are expected to continue climbing this year, up 5-6 percent, according to the U.S. Department of Agriculture’s Economic Research Service. 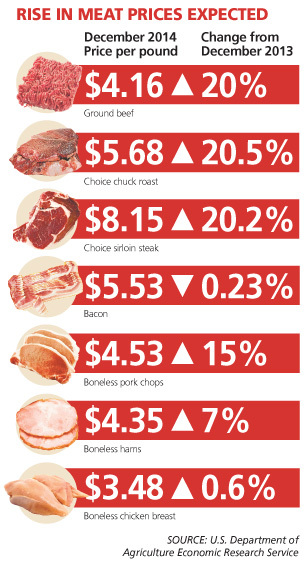 Ms. Eller indicated that, “Prices will likely bump higher, too, for pork, chicken and turkey this year. But the increases are expected to be more modest, based on federal government estimates: Pork chops, ham and rib prices are expected to push 2-3 percent higher, and chicken breasts and ground turkey, 2.5-3.5 percent. The Register article noted that, “Despite higher prices for meat, demand for beef, pork and poultry will likely remain strong, even if consumers shift between them as they find better buys, economists say. “Increasing incomes drive demand, whether it’s from higher pay or more people employed, said Schulz, the ISU economist. “We’ve seen demand improve as the economy has recovered,” he said. The USDA’s Economic Research Service is scheduled to update its Food Price Outlook on Tuesday morning.